Letter from the CEO Dear Reading Partners friends and colleagues, Each year, I continue to be inspired by the collective impact that our Reading Partners community has on student literacy. In the 2017-18 school year, the efforts of our donors, volunteers, board members, school partners, AmeriCorps members, staff, and community partners made it possible to provide nearly 11,000 students across the country with critical literacy skills through one-on-one tutoring. We are proud to share that 85 percent of all Reading Partners students, and 90 percent of our K-2 students, are meeting or exceeding their primary end-of-year literacy growth goal. Thank you for giving our students the gift of reading! of our K-2 students are developing mastery of key foundational reading skills needed to read at grade level. 34 sessions per student on average over the course of the year. Anne, Andrea, and the joy of reading For Anne Miano, a second-year Reading Partners volunteer tutor in Seattle during the 2017-18 school year, Wednesdays from 1:30 to 2:30 pm were absolutely sacred. That was the hour each week when she worked with Andrea, a third-grade student with a love of reading and an infectious smile. Anne discovered Reading Partners one day while searching for a way to make a meaningful contribution in her community. In the two years since, Anne has worked with several students and has been inspired to see them, and the program, grow tremendously. “I tell clients, ‘No, I can’t meet at that time.’ Whether it’s a current project or an opportunity for new work, it doesn’t matter. On Wednesdays from 1:30 to 2:30 I am unavailable to everyone but Andrea. Our time together has a greater impact on my life, her life, the community, and the world than anything else I could be doing at that time.” — Anne Miano, second-year Reading Partners volunteer When Andrea first started attending Reading Partners, she was pretty nervous, but she soon found it to be one of the most enjoyable times of her week, thanks in large part to her affection for “Ms. Anne.” Andrea really enjoyed reading with her mom at home, and having Ms. Anne read with her every Wednesday gave her even more time to practice reading and continue learning. After receiving several prizes for reading 15 books at home during the school year, she set an ambitious goal of reading 100 books at home next year. Go Andrea! of volunteers are satisfied with their experience. Leadership through service Since 2010, over 1,300 AmeriCorps and VISTA members have served with Reading Partners. AmeriCorps members are at the heart of Reading Partners’ work; they are on the ground every day, making sure students receive the programming they need to gain the essential literacy skills they will need for life. As an example of impact, just one Reading Partners AmeriCorps member may coordinate 70+ volunteers who provide up to 1,800 hours of individualized literacy intervention in a year. In 2015, Shawn Wilds joined the DC team as an AmeriCorps VISTA. Shawn was drawn to Reading Partners because she wanted to tap into her passion for education and youth. She went above and beyond in her service by forging new partnerships with community organizations and brought in many new tutors to Reading Partners DC. Shawn served a second term with Reading Partners AmeriCorps and continued to fortify community relationships. All of these efforts led to Shawn being awarded the Segal Leadership Award in 2018. This prestigious award recognizes the achievement of an outstanding AmeriCorps alum whose service demonstrates entrepreneurial vision and leadership to make the world a better place. Shawn continues to work in education as a post-secondary program coordinator where she supports seniors as they unlock opportunities and identify a path for success after high school. Shawn’s time with Reading Partners AmeriCorps confirmed her desire to work in education, as it does for many members. After completing their service, over 50 percent of Reading Partners AmeriCorps members remain within education or in the nonprofit space. Shawn is a shining example of Reading Partners AmeriCorps members continuing to make a difference in the communities they serve well beyond the service year. of members strongly indicated that the skills they developed at Reading Partners will help advance their career. 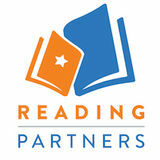 After a year of cultivation, Reading Partners Tulsa successfully formed a partnership with Mayor G.T. Bynum and the City of Tulsa, resulting in more than 100 weekly volunteers and the largest employer-based partnership in the history of the program. In November of 2016, then Mayor-elect Bynum joined in a citywide effort to significantly increase the reading proficiency of Tulsa children by pledging to be a reading partner and issuing a challenge for 2,000 Tulsans to join him. Soon after taking office in January of 2017, Mayor Bynum issued an executive order that allowed City of Tulsa employees to use their lunch breaks to volunteer with Reading Partners. The following school year, more than 100 City of Tulsa employees took advantage of the opportunity and became weekly volunteers. A program validated by evidence Affirmation of Reading Partners’ impact The strength of Reading Partners’ program has been affirmed by a second rigorous, third-party evaluation. This multi-year study, conducted by Augenblick, Palaich, and Associates (APA), a Denver-based research and evaluation firm, was released in 2018 and found that Reading Partners was able to launch quickly, sustain operations, and implement our program with fidelity in Colorado. Moreover, APA found that students served by Reading Partners—and particularly English Language Learners—showed significantly greater improvement in their literacy skills than comparison students not served by the program. Promising outcomes for students and AmeriCorps members Reading Partners’ two-year research partnership with Child Trends, a leading national nonprofit research organization, provides new insights and promising results. The study, which included all four Reading Partners regions in California, found that: 3 Reading Partners was successful in recruiting and engaging students who needed reading support. In fact, 92 percent of the students served in California during the study period were reading below their grade level at baseline. 3 Participating students improved their reading and social-emotional learning skills (83 percent of Reading Partners students improved their social-emotional learning skills by the end of the school year, making gains in social competence, persistence, self-control, and reading engagement). 3 Reading Partners volunteer tutors upheld program fidelity and engaged in positive, supportive relationships with students. Eighty-seven percent of tutors had highly positive relationships with their students. 3 Reading Partners AmeriCorps members gained essential professional skills compared to national AmeriCorps alumni, and nearly 9 in 10 AmeriCorps members were very satisfied with their experience. Rigorous gold-standard research Independent, gold-standard research conducted by MDRC demonstrated, through a randomized control trial, that Reading Partners has a positive and statistically significant impact on student reading skills, is effective for a wide variety of students, and is a resource multiplier for schools. The MDRC evaluation is included in the U.S. Department of Education’s What Works Clearinghouse. Recognition for literacy best practices The 2017 Library of Congress Literacy Awards program honored 15 organizations, including Reading Partners, for outstanding work in the field of literacy and implementation of best practices in literacy promotion. 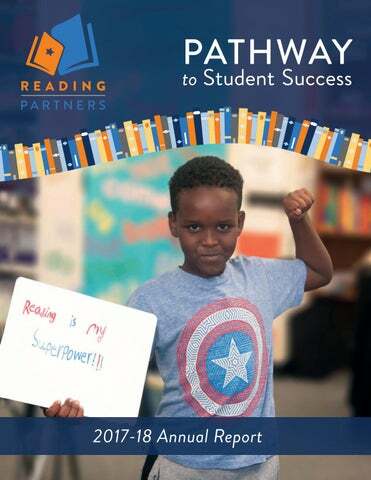 Our 2018-22 strategic plan A track record of success... From 2012 to 2017, Reading Partners made significant investments in scaling its core model, nearly quadrupling the number of students served from 3,000 to 11,000. The organization stretched to reach more than 200 schools in 14 distinct regions, across 10 states and Washington D.C. This growth has established Reading Partners as one of the largest-scale providers of literacy support in the country, with strong evidence of impact for low-income and English Language Learner students across a diverse set of geographic regions. Reading Partners offers a value proposition distinct from other literacy interventions. We mobilize communities, partner with under-resourced schools, and provide differentiated, one-on-one literacy instruction to help students who struggle with reading. individualized tutoring program while expanding our presence in existing geographies. program, and culture that better reflect the diversity of the communities Reading Partners serves and by building partnerships to support a broader national movement for educational equity. Achieve greater financial sustainability Achieve greater financial sustainability by increasing nationally driven resource development and pursuing a greater proportion of multi-year, multi-region investments from a broader set of sources. Ensure organizational success Ensure organizational success by building the systems, staffing, and infrastructure required to more efficiently and consistently deliver our program. Special thanks to Focusing Philanthropy donors who collectively contributed more than half a million dollars throughout the year. *Indicates the full value of a multi-year commitment. Reading Partners 2017-18 annual report features a five-year vision for strategic growth and engagement.